It’s estimated that over 7.5 million Americans have psoriasis. While many people have heard about psoriasis, most have no idea what it is. Since August is Psoriasis Awareness Month, the team at Center for Dermatology and Laser Surgery want to give you some information about this skin condition. Psoriasis is a skin condition that shows itself as patches of red, silvery scales on the skin. When behaving normally, skin grows at a consistent, gradual rate and old skin cells are typically shed every four weeks. When a person has psoriasis, however, they have abnormal lymphocytes that cause this to happen at an accelerated rate. This results in thick patches with dry flakes. It is most common on the elbows, scalp, hands, lower back, and knees. It is seen often in adults, but children can have it, too. Because there are varying severities of psoriasis, many people may have it and be unaware because it is only showing up in faint dry patches. For others, severe psoriasis can leave red, thick, scaly skin across much of their body. In these cases, sufferers often avoid activities like swimming that require exposing their skin. Doctors consider psoriasis to be an incurable, chronic skin condition. Psoriasis is not contagious. Exact causes are unknown, but it is believed that an overreaction in the immune system causes the skin to react with rapid cell turnover that leads to inflamed, itchy, and flaky skin. There are likely genetic and environmental factors involved as well. Cold, dry weather tends to make psoriasis worsen. Also, stress, infections, and certain medications can exacerbate psoriasis. At the Center for Dermatology and Laser Surgery we understand the impact of psoriasis of a patient’s life and we treat psoriasis differently for each patient. Mild cases can be treated with creams, ointments, and lotions. Shampoos, solutions, and sprays can be used for treatment on the scalp. Phototherapy (light) treatments are beneficial to many patients. If your psoriasis is more severe, we might prescribe oral medications or biologics which can greatly improve psoriasis and psoriatic arthritis. Psoriasis research has led to new treatment options that allow patients clearer skin than ever before. It’s important for psoriasis sufferers to know they’re not alone. 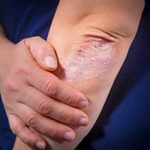 “Many people live with psoriasis and symptoms can be relieved with professional help,” says Dr. Gasch, a board-certified dermatologist at the Center for Dermatology and Laser Surgery. “If you think you have psoriasis, I encourage you to see a board-certified dermatologist to learn about your treatment options.” Don’t suffer with psoriasis alone, call the team at the Center for Dermatology and Laser Surgery, (503) 297-3440, to make an appointment. Hair loss or alopecia is a troubling affliction that can affect every aspect of a person’s life. While many people think of hair loss as a problem among men, women and children can just as easily be impacted by this condition. The American Hair Loss Association estimates that by age 35, two-thirds of American men experience some degree of hair loss. About 40 percent of women suffer hair loss, and for children, three percent of pediatric office visits are attributed to hair loss. 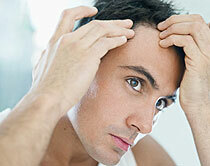 Hair loss can be caused by a variety of factors. Fortunately for those suffering from hair loss or thinning hair, there are a number of treatments available to help stimulate hair growth. Stress: Many individuals experience hair thinning or hair loss following a period of intense stress or emotion, such as a family death, serious illness, or rapid weight loss. Heredity: Genetics is a leading cause of female pattern baldness, accounting for an estimated 30 million cases of hair loss among women in the United States, according to the American Academy of Dermatology. Women who inherit this condition tend to experience hair thinning in their 50s and 60s, and in some cases, hair follicles stop growing completely. Medication: Hair loss can occur as a side effect of drugs used to treat conditions including cancer, arthritis, depression, and high blood pressure. Underlying medical conditions: A variety of medical conditions can cause hair loss or thinning including thyroid problems, autoimmune disorders such as alopecia areata, scalp infections, and other skin disorders. Hormonal changes: Hormones play a large role in the growth of hair, and shifts in certain hormones can trigger temporary or permanent hair loss. For example, many women tend to lose their hair after pregnancy and childbirth, and during menopause. We encourage anyone experiencing a significant hair loss to learn more about their treatment options. For more information, contact the Center for Dermatology and Laser Surgery to schedule an appointment with one of our providers at 503-297-3440.